Well, What do you know? Who knew you could pull off a wedding that doesn’t “cost the earth”? And yes, that might not even cost your or your parents’ hard-earned money. I know what you’re thinking. “It’s not a pretty wedding then!”. Not quite. We’ll show you how. An Eco-Friendly Wedding is not just inspiring but is filled with natural beauty. What a natural floral backdrop can do for a wedding, cannot be recreated with all the decor and embellishments combined. Especially for the young generation of our country who is getting more and more aware about ‘going green’, its a new approach towards a sustainable lifestyle. An awesome way of sharing your values and responsibilities towards nature with your loved ones on your special day, your wedding day. 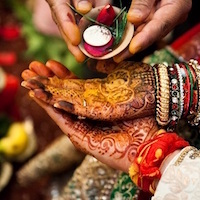 One can never forget an Eco-Friendly Wedding as the concept is still new but growing in India. The biggest “Save” and “Expenditure” of your Eco-Friendly Wedding can be decided at this very first step. You can either save on all the energy, money, fuel, travel expenses by carrying out the wedding ‘locally’ meaning in your own city. If that’s not feasible for you, you can choose a nearby city that has a lot of greenery and array of flora and fauna. And if you have a lot saved up only for this day, then the best you can do is a destination wedding in the places with big farmlands, vineyards, huge botanical gardens, hilltops, foresty eco-friendly resorts. India is the Amazon for such kind of natural backdrops. So you don’t have to move to another country to have a scenic wedding. You can check out Eco-friendly hotels and resorts. They actually provide all the facilities and function in a sustainable manner. So basically for an Indian Wedding, that means NOT in summers. That’s where you get to save heavy extra that you’d otherwise spend on air condition systems (harmful to the air), heavy indoor lightings (more electricity usage), and refrigerated water or drinks. An outdoor day wedding is a contemporary trend that has picked up some pace in India. We are all in for those. It’s absolutely perfect for a wedding to be environment-friendly when it’s during daytime and outdoor. It lets the natural light fall on the vibrant colors of the wedding decor and outfits. Of course, the wedding pictures are much more stunning in the daylight. Day Weddings allows guests to enjoy the sun in the chilly winter season. However, if the wedding has to be in moderate seasons like Feb-April and August-October, you can opt for an after 6 pm events. This will be one of the most memorable physical items from the wedding that will stay with you and your guests (in their minds) for a long time. We all know how many trees are cut every time the world needs paper. You can do your bit by switching to E-invites, plantable seed papers, recycled papers, eco-friendly papers made from elephant poop. Plantable seed papers will for sure make an impression as it can be sown in the mud which will grow up to be a plant and will forever stay with the guests. Sites like Seedpaperindia, Paperlesspost and A2naturals provide such products. You can DIY your own wedding cards if you have a big family of cousins and friends who will help you do it beforehand. Reserve the paper invites for elder members of the guests and send WhatsApp video invites to rest of the guests. Always use the seasonal flowers and ask your vendor if the flowers are grown without chemicals, color spray and say ‘no’ to imported flowers loaded with pesticides. What do you do with the flowers when the wedding is over? Well, if you put up in Delhi/Mumbai, you can contact AVASYAM by Society for Child Development (Delhi) and Green wave (Mumbai). They will collect the flowers and turn them into natural Holi colors and incense sticks. So the flowers won’t end up in the trash bin. You can ask the decorator to use the flowers creatively using sustainable/unused objects at our homes like wine bottles, matka, small pots, pickle jars, mason jars, tea lights etc. Rule out all the plastic water bottles, paper napkins, paper table sheet, plastic non-biodegradable spoons and plates. Use glass wares, steel wares, cloth napkins, cloth table sheets, edible cutlery for desserts and sweets. Use as much colorful pieces of clothes and decorative papers instead of expensive decorating items, use mirrors as signages. 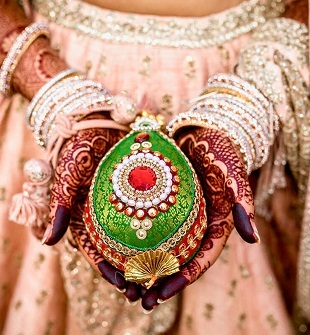 Go green with your ‘mehendi’ by using homemade or homegrown organic henna. Switch to lots of candles, tea lights, lanterns, fairy lights and string bulbs during evening events as it uses the least electricity. It will give the whole ambience a romantic mood. Use dried flower petals and bubbles instead of confetti and balloons. It’s more than a pleasure for Indian bride’s and groom’s family members to send their guests back with a handful of wedding favors. They take pride in making their guests happy. Since its a tradition, we understand you don’t want to compromise on this. Well, what if I tell you these wedding favors will be more authentic and rich (quality-wise) than any gift box you would buy. Its trendy, fun and eye-catchy. Yes, it might take you just a bit more of your time but you can pull it off. Small potted herbs like thyme, chives, basil, parsley, coriander, things people use in their daily lives can be kept for guest to take away whatever they please to. You can even DIY small jars filled with organic homegrown spices for your guests. Add few organic cosmetics like hand-made soaps, herbal lip balms into the wedding favor box. These combined thoughtful gestures will probably be the most useful, organic and memorable giveaways for your guests. Oh and don’t forget to add some sweets! Amongst the hottest actors of Bollywood, Milind Soman married his longtime girlfriend Ankita Konwar and they both happen to be environment enthusiast. They are everything, you call, “eco-friendly”. They have set an example of going ‘green’ on the auspicious day of their wedding which was also on Earth Day. They had a pure organic wedding, and by organic I mean, from their wedding outfits to the Mehendi, floral garlands, organic henna, organic haldi, natural venue, minimal energy and resource-use wedding. They even went on their social media handles as #barefootwedding, literally, tying the knot in Spain, with a natural waterfall backdrop. They are by far the most happening eco-friendly couple and have inspired a lot of us by their Eco-Friendly Wedding. India is gradually leading its way towards a sustainable and eco-friendly lifestyle. 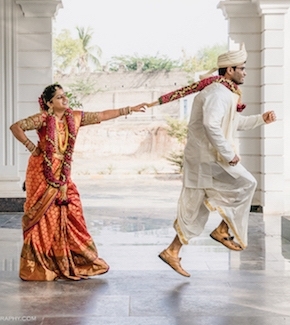 Weddings in India are a huge deal. Imagine if even half of us are able to manage to go ‘green’ in some way, if not all, how much resources we would save from exploitation? I think its pretty much clear how much we need earth than the earth needs us. Anyway, isn’t this cooler than the usual insatiable Indian weddings? It’s fresh and keeps us connected to our environment in every way. Eco-Friendly Wedding is in guys!